We now have paid plans that give users access to Due Projects, Time Tracking, Expenses, and more advanced features. 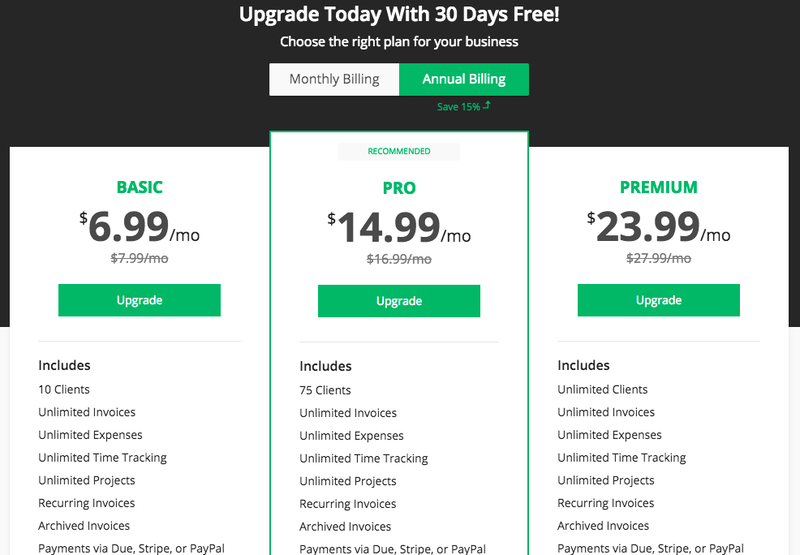 We still provide free plans with limited access and a max of 3 clients. These paid plans will allow us to put more resources towards improving our business tools and launching new features such as Virtual Terminals, Subscription Billing, and digital wallets. All paid plans come with a 30 days free trial! All you need to manage your account billing can be found in your account settings. Here you can find the current status of your subscription and the total team members that can access your account including any additional team member access you have purchased. Clicking “Manage Billing” will take you to a Chargebee portal where you can manage your subscription plan, addons (such as adding more team members to your account), payment methods, invoices, and billing history. NOTE: if you have purchased additional team members and you change your subscription plan directly in the chargebee portal, you will need to include the same number of additional team members on checkout or some of your team members may lose access. During this transition to paid plans, recurring invoices and recurring expenses will continue to run in their current state for all free plans until Feb 1st 2019. You will be able to access your recurring invoices and recurring expenses by starting a free trial of any paid plan. All existing payment methods enabled on your account will remain active no matter what plan you are subscribed to. You can continue to accept payments as you always have! 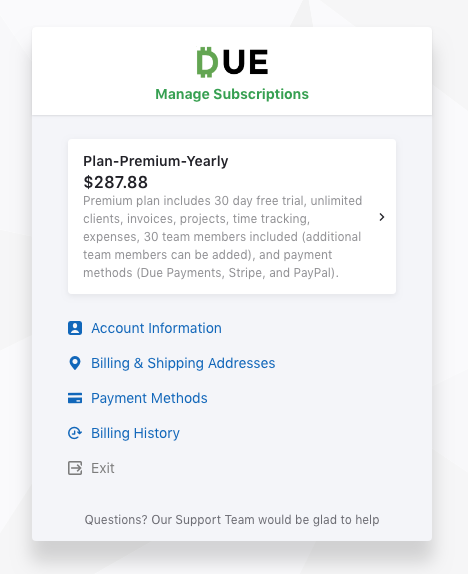 The post How to Manage Your Due.com Account Subscription appeared first on Due.